Clear skies. Gusty winds during the evening. Low 57F. NNW winds at 20 to 30 mph, decreasing to 5 to 10 mph. Higher wind gusts possible..
Clear skies. Gusty winds during the evening. Low 57F. NNW winds at 20 to 30 mph, decreasing to 5 to 10 mph. Higher wind gusts possible. Harmony Oaks replaced outdated and damaged public-housing units in post-Hurricane Katrina New Orleans. Built by McCormack Baron Salazar, the same developer that plans to construct two mixed-income housing developments in Galveston, Harmony Oaks is thriving. Harmony Oaks residents Rosalind Jones-Francis, Jocquelyn Marshall and Jacqueline Kennedy talk at the community center. Computer training is one of the many new amenities in Harmony Oaks. The community center at Harmony Oaks features a gym for residents’ use. Harmony Oaks replaced the C.J. Pete projects in New Orleans after Hurricane Katrina. The units were built by McCormack Baron Salazar, the same developer that plans to construct two mixed-income housing developments in Galveston. NEW ORLEANS — There’s an empty lot in the middle of Harmony Oaks. It appears well-managed enough, but it’s not a park or a planned green space. It’s just a lot where a neighborhood elementary school once stood. All that remains of the razed building is some white cement and playground equipment. Riding past the lot on a golf cart, Jocquelyn Marshall sighs and says she wished the school, which was once honored as a masterpiece of modernist architecture, had been kept around as the neighborhood was rebuilt. As it is, the fenced-off land is something of a time capsule — a last piece of undeveloped land surrounded by new homes and apartment buildings and quiet streets in a part of the city that once was considered among the most dangerous. “Before we were dodging bullets,” Marshall said. “There was a lot of crime, shootings basically every week, and most of the time, innocent bystanders were killed. Harmony Oaks was built to replace one of New Orleans’ largest housing projects, also known as the C.J. Peete or Magnolia projects. 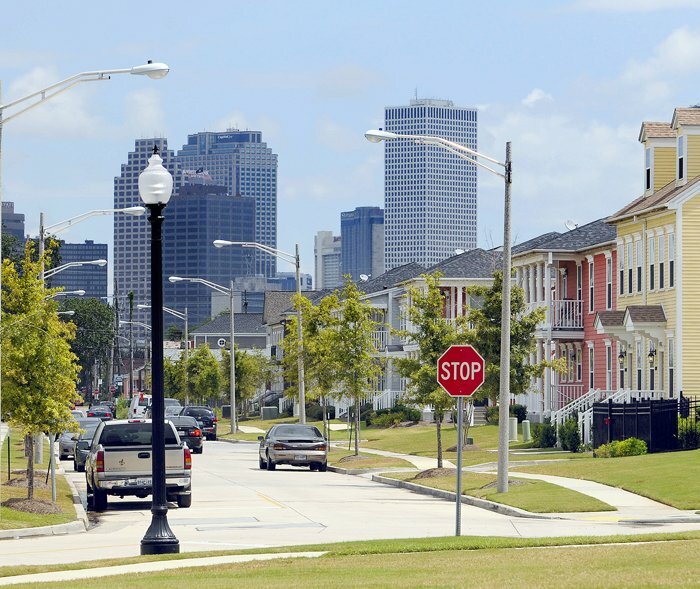 Although demolition of the old projects started in 1997, work on a replacement gained greater urgency after Hurricane Katrina forced the evacuation of about 550 residents in 2005. At its height, the Magnolia projects consisted of 1,400 apartment units. 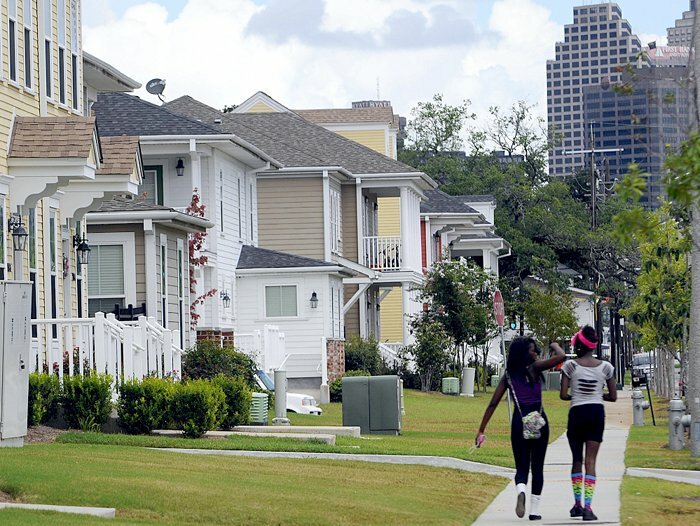 But after Katrina hit New Orleans in 2005, the projects were abandoned and the city fast-tracked demolition as part of a broad effort to address housing issues. The last of the old projects was torn down in 2008, the same year that Hurricane Ike hit Galveston. The first resident of Harmony Oaks arrived in 2010. Harmony Oaks was built by McCormack Baron Salazar, the same developer that plans to construct two mixed-income housing developments in Galveston. Construction is expected to begin at the beginning of next year. Like Harmony Oaks, Galveston’s Cedar Terrace and Magnolia Homes projects were flooded and demolished. In all three cases, McCormack Baron Salazar was chosen to rebuild mixed-income housing projects in the location of the former projects and take over management of the apartments from the local housing authorities once they are completed. In Galveston, the mixed-income developments have been highly controversial. Last year, the winners of the city council election ran largely on the platform of opposing public housing. Much of the last year has been spent sparring with the state’s General Land Office and the U.S. Department of Housing and Urban Development about housing-related issues. Housing opponents said plans to rebuild in low-income neighborhoods are flawed. They also said they doubt the developments will remain as mixed-income — they will become public housing projects because people able to pay full-market rent won’t want to live there. While the final outcome in Galveston’s housing debate is years away, in New Orleans, it appears Harmony Oaks and its residents are thriving. Marshall grew up in the former C.J. Peete projects and returned to Harmony Oaks after it opened in 2010. She is a member of the local neighborhood association and an employee of Urban Strategies, the case management company that oversees Harmony Oaks’ human capital plan. Harmony Oaks is an example of new urbanism, the planning theory that emphasizes, among other things, placing walkable, compact communities in proximity to public transportation and work opportunities. Indeed, residents who turn their eyes east have a clear view of New Orleans’ downtown skyscrapers. Harmony Oaks also is minutes away from the city’s posh Garden District and French Quarter. Within the boundaries of the neighborhood, things feel antiseptic. The uniform, brick buildings that existed before have been replaced by a small variety of new designs. Most are condo-like buildings that house between two and four families, though some larger apartment buildings still stand at the corners. The uniformity of the neighborhood might help disguise the diversity of its residents. Of the 460 housing units built on the nearly 26-acre site, more than two-thirds are reserved for low-income residents. There are 193 units for public housing and another 144 are rent-controlled, low-income tax credit units. The final 123 units are rented at market-rate. The rental apartments range in price from $650 per month for a one-bed, one-bath “garden” apartment, to $1,220 per month for a two-story, 2.5 bath, three-beadroom town house. Officials from McCormack Baron Salazar said Harmony Oaks is filled to 99 percent capacity and the waiting list to fill the low-income units numbers in the thousands. In sheer scale, Harmony Oaks is larger than the two Galveston developments combined. Cedar Terrace, which will be located mid-island, north of Broadway on 5.9 acres between 29th and 30th streets and Sealy Avenue and Church Street, will contain about 120 units, 60 of which will be put aside for public housing. Magnolia Homes, planned to be built north of Mechanic Street between 15th and 18th streets, will contain about 160 units, 82 of which will be public housing. All of the units not planned to be public housing are to be market-rate housing. Harmony Oaks cost $172 million to develop. The Galveston developments will cost about $72 million. While McCormack’s plans for Galveston are similar to those for New Orleans — down to amenities like swimming pools, community corners, parks and playgrounds — there is one thing Galveston won’t have: the human capital plan that many credit the development’s success to. The plan at Harmony Oaks, which directs the types of services provided to the residents, was created in a collaboration between the developer and residents during a nine-month process. It resulted in things like a construction-training program for low-income residents, adult education classes at the community center and a kind of entrepreneur’s market at a vacant lot nearby where residents can operate small businesses out of trailers. “The goal is not to build a mixed-income community and then return public housing or other subsidized residents to it and to have them stick out and become unable to live in this community or to have them evicted because they haven’t been prepared,” Sandra Moore, president of Urban Strategies, said. The Galveston Housing Authority plans to have its own human capital plan for the housing developments and is accepting bids to determine who will run it. Moore said Urban Strategies, which is corporately related to McCormack Baron Salazar, does not plan to bid on the Galveston plan. Instead, it appears the project will be put in the hands of local service providers, such as the United Way of Galveston. The manager of the human capital plan could play a key role in determining the success of the Galveston developments. Kirk McClure, the University of Kansas professor who the city and housing authority have used as an expert on public housing, said McCormack has a history of success with projects like the one proposed in Galveston. “If you want somebody to take on a really hard task, that’s the team you want,” McClure said. McClure said there’s no clear data on the percentage of mixed-income projects that are successful. In a presentation to the city council on the viability of Galveston’s developments, he said, in his view, the most successful developments were the ones built in booming real estate markets. Now, eight years after Katrina, New Orleans is one of those ultrahot markets. As of May, commercial real estate transactions in 2013 had already surpassed total sales from 2012, spurred by the billions of federal dollars put into restoring the city’s infrastructure. While its success may be indicative of larger trends, it is the smaller things that today’s Harmony Oaks residents appreciate. Gloria Williams lived in the neighborhood when it was the C.J. Peete projects and returned in 2010 when the area reopened as Harmony Oaks. “I never thought that I would live like this,” Williams said. Williams, who fled to St. Louis after Katrina, said she was skeptical of Harmony Oaks development when it was first proposed because of the actions of government officials after the hurricane. But, she said, the developers of the Harmony Oaks followed through on their promises, down to the smallest details. The developers also promised that Harmony Oaks would be safer from crime than the C.J. Peete projects were. In the 1990s and early 2000s, the projects were often cited as among the country’s most dangerous. To make it safer, the landlords began taking a harder line on policies, mandating a one-strike rule for residents when it comes to violating lease agreements. “It is not easier to be kicked out — it is more certain,” Moore said. McCormack Baron Salazar officials said that the neighborhoods’ crime rate has decreased fivefold and is now lower than the rate of crime in New Orleans as a whole. Indeed, a review of police calls to the streets in the past two years show most calls are related to traffic, not the drug and violence problems prevalent in other parts of the city. The development hasn’t changed life just within the streets that make up the neighborhood, but to areas nearby, as well. In 2010, the New Orleans Hornets helped install new basketball courts at a nearby park. Last December, the city approved construction plans for a new 42,500-square-foot shopping center, known as Magnolia Marketplace, to be built on the north side of the neighborhood. Marshall said there were things she missed about the old neighborhood, particularly the sense of community. Of the residents who live in the neighborhood now, only 78 were former C.J. Peete residents. But given the choice of bringing that community of friends and neighbors back or having Harmony Oaks, Marshall said there was a clear choice. Contact reporter John Wayne Ferguson at 409-683-5226 or john.ferguson@galvnews.com. If it can work in New Orleans , it should be able to work any where, especially here. A key component seems to be the 'human capital' plan. At the moment, it is unclear how that piece will look or if United Way has the wherewith all to pull key social services together into a workable and sustainable program. Murder rate in New Orleans higher than Chicago . Would that be of any significance to this article? It says in the article the mixed income housing should be built near good transportation and employment opportunities. None of which Galveston can offer. Without that it will fail and it definitely does not promote fair housing. Everyone knows Galveston is one of the most ill advised places to build public housing. Time to move on and look at other options. Was a bad idea 50 years ago, an even worse idea now, knowing what we know about the history of Galveston and public housing. People displaced by Ike should have been given Section 8 vouchers 5 years ago so they could be in good neighborhoods with good schools, instead advocates want them to come back to a poor neighborhoods with below average schools and no opportunity or transportation. Tells you something about their so called compassion. New Orleans is one of the hottest real estate markets in the country right now. I looked into real estate there following Katrina and I still couldn't find a deal! Galveston has been a buyers market for the last 20 years. I walked around my Galveston block yesterday and saw 4 houses that have been for sales for months with "price reduced" signs on them. New Orleans is a major city that has jobs mass transit, and a growing economy. Galveston was losing population and jobs long before Ike. There is no comparison between these 2 cities! It would appear the reporter went to New Orleans to conduct research for this story. There are a few (very) quotes to indicate some residents there were interviewed and, I would also hazard a guess that a fair amount of information was thoughtfully provided by McCormack Baron Salazar, on their success in New Orleans. I would urge the reporter to also contact his colleagues at the Times-Picayune, in particular, Chris Rose and Lolis Eric Elie, whose award-winning and in depth reporting of New Orleans, post-Katrina, included much knowledge of the performance of the many FEMA camp-followers who made their millions on "rebuilding". A better and more objective view of MBS might be available from this fairly obvious source. If such background research was indeed done at the local newspaper, it would have been good to indicate that in the report, as it would certainly add some credibility to the rosy picture of MBS' transformation of the C.J. Peete projects in NOLA. "Indeed, residents who turn their eyes east have a clear view of New Orleans’ downtown skyscrapers." And that my friends is where the offices are that holds middle class jobs. If you want to see those jobs from Galveston you better have a telescope powerful enough to see Houston! Which was exactly what the consultant Dr McClure hired by the COG confirmed! Galveston had a 6 month real estate boom around 2006 fueled by second home buyers, but we have been losing full time population since 1990. A truly naive whitewash of a far more complex situation, as most of the points raised below properly indicate. It is, however, totally consistent with GDN's extraordinarily biased view in favor of public housing. Maybe public housing is a good idea in certain communities. I haven't seen anyone make a compelling case why it makes sense in Galveston. Like 69 Chevy, I don't see why a NOLA success story is particularly germane to a Galveston readership. Go find a success story in an impoverished town of 50,000 lying in a floodplain. Then I'll listen. Maybe. Wait until the next MBS cheerleader report comes from the newspaper and starts touting all the local contractors who will gain business working on the new Projects, so as to trickle down the federal largess to Galvestonians (rather than just people who live in St. Louis and Los Angeles). Or, has that pep rally already started? It might be worthwhile to find out about the small, local, (minority-owned) construction and demolition businesses in New Orleans after the Katrina recovery Czar began his reign, who were stretched out so far by prime contractors they could not make their payrolls and had to try and seek relief in court for (taxpayer) money owed to them by the layers of prime and mid-level, out of town, contractors. .
That is the sort of trickle down largess to small local businesses that is the kiss of death. The experienced FEMA Camp-Follower gets the money, pays themselves the bonuses, takes the right city officials to the best show in town; and gets the small guy to do the work and then delays payments until he breaks. There are some less rosy stories of hurricane demolition and construction in New Orleans and, as MBS are quick to point out themselves, they were right in the front of the line. So, it is maybe worth keeping this story in some perspective.